It has been said that it takes children to make a community. The sounds of happy, delighted children as they laugh, play and explore certainly do bring a warm feeling to any listener. In our experience, ‘fun’ sounds the same in any language, and helps that community feel like a home for everyone. Part of how a community helps their children grow, learn and develop are the opportunities that we give them to play. Dynamo has always believed in the value of good play that offers children of all ages – from toddler all the way to playful grownup, and every stage in between. It helps their bodies grow stronger, develops balance and motor skills, teaches them how to find and overcome their physical & mental limits. 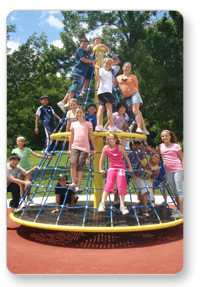 In a playground, strangers can be instantly included as friends and join together into dynamic community play. And, in the right playground, everyone can find their way to enjoy the same activities no matter their abilities. How can we make sure that all of the children get to take advantage of the many benefits of this play? Through unique equipment and play space design! At Dynamo, we don’t do ‘ordinary’ play equipment. We focus on exciting creativity so that designs are enticing and appealing, to attract all children to go to the playground and check it out. Even more, once they discover the special Dynamo play equipment, they’ll want to stay for hours of play, then return again & again for more! These custom designed Ropes Courses offer so much in a single structure. With abstract designs, the experience for children is every changing as they move through the structure, engaging more of their body in active play. The non-linear method also engages their mind in decision making – where to go, how to play – and gives them a blank canvas for imagining their own play environment. The possibilities are nearly endless. Pushing far beyond the ‘box’ of traditional designs, at Dynamo we’re really kids at heart. We make the coolest, funnest playgrounds – and we play on them too! Come and join us, because Play Matters at Dynamo Playgrounds!